The PowerShell script included here will automatically undeploy and redploy you azure service and will even wait until all the services are in the ready state. I will leave you to checking those commandlets out, and they worth every penny spent. Now lets check how we get the deployment working. 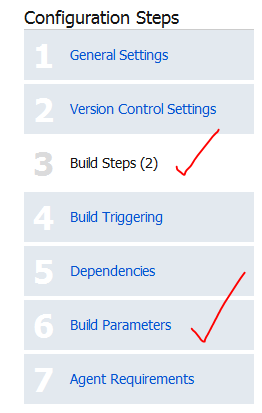 The basic idea is that you have a continuous integration build configured on the Build Server in TeamCity, then what you do is configure the CI build to generate artifacts, which are basically the output from the build that can be used by another build project e.g. You can take the artifacts for the CI build and then run Functional Tests or Integration tests builds that run totally separate from the CI build. The idea here is, your functional and integration will NEVER interfere with the CI build and the Unit tests. Thus keeping CI builds fast and efficient. Ok, so, lets do a quick check at my CI build that spits out the Azure Packages. As we can see above, the CI build creates an Artifact called AzurePackage. The way we generate these artifacts is very easy. 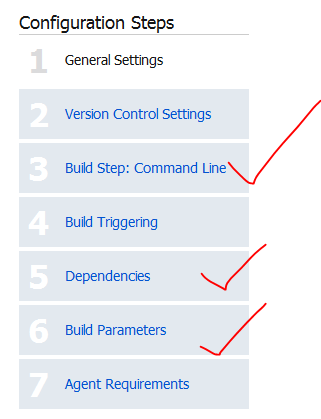 In the settings for the CI Build Project we setup the artifacts path. So, we will look at the build steps to configure. As we can see below, we just say where the MSBuild is run from and then where the unit tests dll’s are. Cool, now we need to setup the artifacts and configuration. We just mention we want a release build. Ok, now we need to tell our Azure Deployment project to have a dependency on the CI project we configured above. So lets now go check out the UAT Deployment project. This project will have dependencies on the CI build and then we will configure all the build parameters so it can connect to your Azure Storage and Service for automatic deployments. Once we done here, we will have a look at the powershell script that we use to automatically deploy to the cloud, the script supports un-deploying existing deployment slots before deploying a new one with retry attempts. Ok, lets check the following for the UAT deployment project. The above screenshot is the command that executes the powershell script, the parameters (%whatever%) will resolve from Build parameters in Step 6 of the screen shot above. Here is the command for copy/paste friendless. Of course if you using some other Database then you do not need the Neo4j stuff. This is the input for a deploy-package.cmd file, which is in our source repository. Now, we also need to tell the Deployment project to use the Artifact from our CI Project. So we setup an Artifact Dependencies as show below in the dependencies section. Also, notice how we use a wildcard, so get all files from AzurePackage (AzurePackage/**). This will be the cspackage files. Notice above, that I have a SnapShot Dependency, this is forcing the UAT deployment to USE the SAME source code that the CI build project is using. So, the parameters are as follows. The Deployment scripts consist of three files and remember I assumed you installed the Cerebrata Management Command Scriptlets. echo ^& "%~dpn0.ps1" %* >>"%tempscript%"
Ok, and now here is the PowerShell code, Deployment-Package.ps1. I will leave you to read what it does. In Summary. Using the certificate store to retrieve the certificate for service connections via a cert thumbprint – users cert store under the service account that TeamCity runs on. throw "AzureManagementCmdletsSnapIn missing. Install them from Https://www.cerebrata.com/Products/AzureManagementCmdlets/Download.aspx"
Write-Verbose "Finding blob container $blobContainerName"
Write-Verbose  "Container $blobContainerName doesn't exist, creating it"
Write-Verbose  "Found blob container $blobContainerName"
Write-Verbose "Uploading blob $blobName to $container/$blobName"
Write-Verbose "Checking if deployment is deleted, current retry is $triesElapsed/$maximumRetries"
Write-Verbose "Deployment is now deleted"
throw "Checking if deployment deleted has been running longer than 5 minutes, it seems the delployment is not deleting, giving up this step." Write-Verbose "Checking if all role instances are ready, current retry is $triesElapsed/$maximumRetries"
Write-Verbose "All role instances are now ready"
throw "Checking if all roles instances are ready for more than one hour, giving up..."
Write-Verbose "Neo4j binary does not exist in blob storage. " throw "Couldn't find the Azure management certificate in the store"
throw "The private key for the Azure management certificate is not available in the certificate store"
Write-Verbose "Sent Delete Deployment Async, will check back later to see if it is deleted"
Write-Verbose "Config File Location: $ConfigSource"
We will need to edit the Cloud Project file so that Visual Studio can create the cloud package files , as it will then automatically run the cspackage for you which can be consumed by the artifacts and hence other build projects. This allows us to bake functionality into the MSBuild process to generate the package files without the need for explicitly using cspack.exe and csrun.exe. Resulting in less scripts, else you would need a separate PowerShell script just to package the cloud project files. Below are the changes for the .ccproj file of the Cloud Project. Notice the condition is that we generate these package files ONLY if the build is outside of visual studio, so this is nice to keep it from not always creating the packages to keep our development experience build process short. So for the condition below to work, you will need to build the project from the command line using MSBuild. Here is the config entries for the project file. However, in a nutshell, you can have something like this in place, this means you can then have separate deployment config files, e.g. Just use the following config in the .ccproj file. Here is a sample ServiceConfiguration.uat.config that will then leverage the transformations. Note the transformation for the web and worker roles sections. Our worker role is Neo4jServerHost and the Web is just called Web. You will need to install the Certificate and Private Key (Which must be marked as exportable) to your User Certificate Store. This file will have an extension of .pfx. Use the Certificate Management Snap-In, for User Account Store. The certificate should be installed in the personal folder. Once the certificate is installed, you should note the certificate thumbprint, as this is used as one of the parameters when executing the PowerShell script. Ensure you remove all the spaces from the thumbprint when using it in the script! You’ll now find a package waiting for you at ”C:\Code\MyProject\MyProject\MyProject.Azure\bin\Release\Publish\MyProject.Azure.cspkg”. 2) Make sure you have the required management certificate installed on your machine (including the private key). 3) Now you’re ready to run the deployment script. It requires quite a lot of parameters. The easiest way to find them is just to copy them from the last output log on TeamCity. You will need to manually execute is Deploy-Package.ps1. The Deploy-Package.ps1 file has input parameters that need to be supplied. Below is the list of parameters and description. Note: These values can change in the future, so ensure you do not rely on this example below. -Verbose: You can use an additional parameter to get Verbose output which is useful when developing and testing the script, just append -Verbose to the end of the command. Note: When running the PowerShell command and the 64bit version of the scripts, ensure you running the PowerShell version that you fixed in the readme file from Cerebrata, do not rely on the default shortcut links in the start menu! Well, I hope this will help you automating Azure Deployments to the cloud, this a great way to keep UAT happy with Agile deployments to meet the goals of every sprint. If you do not like the way we generate the package files above, you can choose to use CSRun and CSPack explicitly, I have prepared this script already, below is the code for you to use. "Packaging the azure Web and Worker role." throw "The packaging process returned an error code." throw "The deployment process returned an error code." note, if using .Net 4.0 which I am sure you all are, you will need to provide the text files for web role and worker role with these entries. Thanks to Tatham Oddie for contributing and coming up with such great ideas for our builds. I haven’t tried it yet with more than one instance, so it’s possible that Powershell is doing something weird when doing typecasting for a single item in the list, but it doesn’t work for me as-is. But thanks for your examples. I found the walkthrough to be helpful. Cheers! Thanks for the feedback. What version of the cmdlets are you running, I know they came out with a new version of them and perhaps they changes some of the graphs? I’m using the version they just recently released, so that could have been the issue. Looks like they changed how some of the objects are instantiated. I know I had some troubles the last time they changed the Powershell commands as well. Here is a new script I use for functional test deployments to a Build Server. #Azure DEV TEAM should wake up and smell the coffee, 1.5SDK is unencrypted cspkg, so why does csrun not support using cspkg and only csx! Here is another script for tearing down the deployment on a Build Server.